A huge number of Farmington residents, in 1948, came out to welcome Santa Claus. Observe that absolutely no-one is eating! 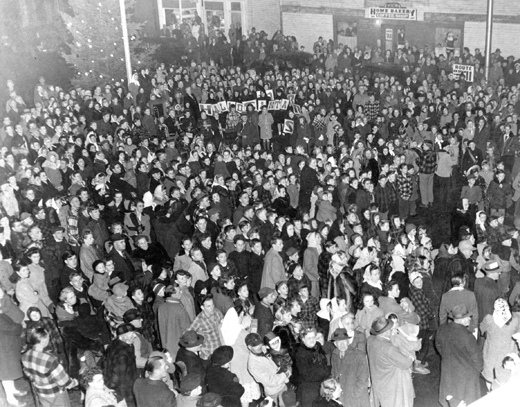 FARMINGTON [--] Back in 1948, a great multitude assembled on the Square in Farmington a few days before Christmas for word had flashed round the town that Santa Claus was coming. Remember, it was only a dozen or so years after the Great Depression, a horrific time that still weighed heavily on the collective psyche. Thus everyone hoped to snag a free candy cane, being something that might have sustained a family for almost a week if made into a thin soup, with an onion and a potato, just a few years back. A historic photograph of that night, in the possession of Norma Park, shows hundreds and hundreds of people waiting expectantly. The picture also contains several other interesting clues to life back then. For instance, not a single person was eating food! Can you imagine 1,000 Americans gathered together nowadays, and not one of them filling their face with some sort of junk? Educationally, though, little has changed, as indicated by the spelling mistake in the welcoming banner that presumably should say "Hello, Santa," but doesn't quite. Back in 1948, though, some things were definitely better. Look at the upper left of the picture - there is a decent sized Christmas tree, festively illuminated. Too often, nowadays, Farmington has a Christmas tree on the Square that, while held in affection by most, doesn't quite come up to snuff, or sparks controversy, or is the subject of a disaster. The 2010 Christmas tree is such a one. It was ceremoniously lit up with colored bulbs last Saturday, after Emma B. Gelinas had got everybody in the right spirit with some seasonal songs. This one is a midget [--] a Charlie Brown Christmas tree, in the words of Roger Belanger, a lifelong resident who was assuredly in that 1948 picture, waiting for Santa near the big Christmas tree and not eating. Like a Yule tree in the sky. It's Number Four, 'cause Three ain't there. Ere Five arrives upon the Square? A deafening crash, that sucker's done. But then its branches all fell off. For biggest's best, we all agree." A Bud is ever apropos. You'll notice that a pipsqueak of a tree was installed that year, too, but had to be replaced due to fierce public pressure. Things are different now, though, and the 2010 conifer, albeit a Charlie Brown tree, needs fewer light bulbs, which converts into a saving of several dollars over the course of the holiday season. These are tough times, and while we may not be quite back to candy cane soup days, every penny has to be pinched. It must be noted too, that more than compensating for a tiny tree, the town has multiple strings of colored lights overhead that create a cheery ambience through the whole of downtown each evening and puts Rochester (Farmington's southeast parish) to shame.